Earth Fare Opens in Indiana – GIVEAWAY! Central Indiana is home to a fare share of health food stores and specialty markets, however the news Earth Fare was opening a location on the north side of Indianapolis sent many of us foodies into a tizzy. Earth Fare is out of North Carolina and the location opening Wednesday, November 7th at Hamilton Town Center is the first location in Indiana for the chain. Think Whole Foods, Trader Joes, Fresh Market. I had the chance to get a sneak peek yesterday with Sara and to say I was impressed is an understatement. 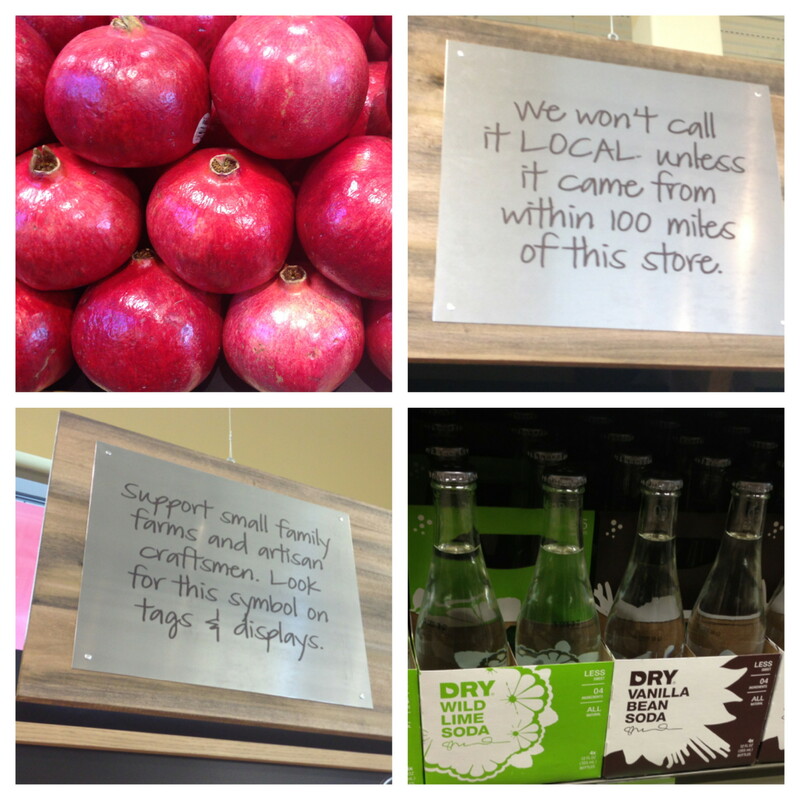 Earth Fare has a Food Philosophy which they stand by for every product in their store. No high fructose corn syrup, no artificial flavors, no bleached or bromated flour, no artificial fats or artificial trans fats, no artificial sweeteners, no antibiotics in meat or dairy, no artificial colors, and no artificial preservatives. Whew! They also offer free butchering, seafood preparation and fromage (cheese) services. I really liked Earth Fare’s policy to sample anything in the store. You want to try something? Flag down an employee. They’ll open anything up and let you try it. I was also blown away by the wellness section. It had over a dozen sample sizes and travel sizes (hello stocking stuffers!) of cool products that are perfect for those of us who hate makeup, lotions and soaps made withe chemicals. They also carry my favorite soda, DRY Soda, the first store in the state to do so. Earth Fare also believes in being a part of the community. Each Thursday night, they host Family Dinner Night from 4-8pm. We’ll be checking it out this week with Holly while I stock up on Throat Coat, fancy shaped pastas, cheese, pickles, and more. 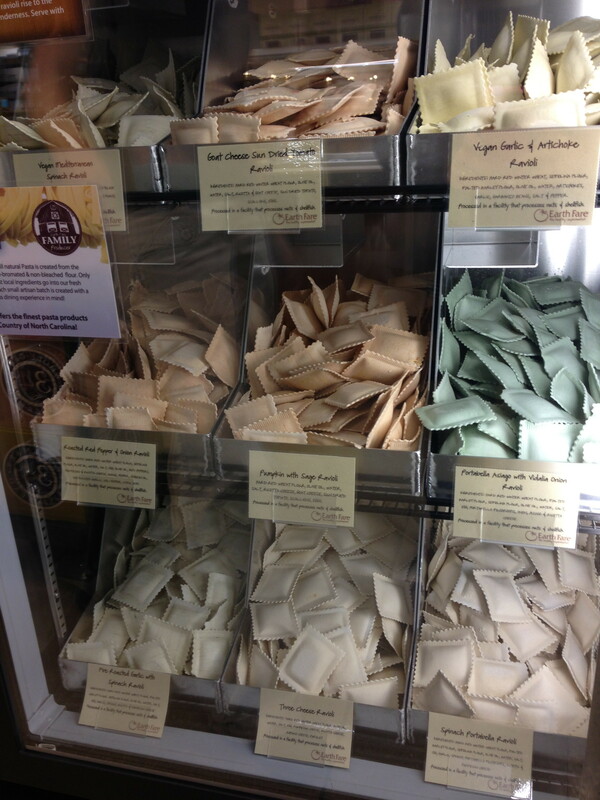 By far, the coolest thing I saw setting Earth Fare apart from the local competition is the Ravioli Case. I’ve never seen a frozen bulk ravioli case before. You can mix and match as much or as little as you want into a container. I can’t wait to try them all. Now this is where I typically go into beer and wine selection, but unfortunately, Earth Fare has to wait for Hamilton County to issue a permit. Trust me, I’ll be the first one in line when it’s available. *Disclosure: Earth Fare contacted me about a tour of their new facility in Noblesville, Indiana and provided me with the gift card for a giveaway. All views expressed in this post are my own. And I do follow @EarthFareNBL on The Twitter. Great! I have all of your entries recorded. I love natural peanut butter, too. Especially in light of the recall? Grind your own is a good option. Wow! A freezer full of ravioli! I must try some. That by far is one of the coolest things I’ve seen to date. I’ve always been a big fan of the pasta, quinoa and gnocchi at health food stores! Now officially following them on both Facebook & Twitter – thanks for the heads up! I’m so lucky to have an Earth Fare close to my home (in Asheville, NC). They are my favorite store. My favorite product is their brand of amino luqids (which sadly have disappeared from our store’s shelf). Basically, though, I’ve found that the Earth Fare brand of just about everything is superior to the other versions. Thanks for this opportunity! Fantastic! I want to visit Asheville (Beer City, USA!)!! Oh yeah … Asheville is that and a lot more! 🙂 Oh, BTW … is this giveaway for an earth fare gift card or one specific for the store in Noblesville? If it’s just for Noblesville then I’ll have to (sadly) take myself out of the contest. have a great day! The gift card is redeemable at any location! Thanks so much for the review Tamre! I have been waiting for it to open and am so glad that you were able to get a preview and let everyone know what to expect. Thank you for the kind words, Rachael! You’ll love it. I just saw on their FB page that they’ll be giving away reusable totes during the grand opening tomorrow! We’re big fans of anything coconut. Oil, refined or unrefined, and coconut butter are faves! I shop almost exclusively at health food stores, so it’s hard to pick just one product. When it comes to Earth Fare, I’m most excited about the bulk bins and all the options available. My favorite health food store product is organic chocolate milk. It tastes great, is good for the community, and a great post-exercise muscle re-fueler! My favorite health store item isn’t a food, but I’m a big fan of the (much better quality) probiotics and vitamins that they sell. I liked Earth Fare on facebook! I think our favorite health food store item would be all the milk choices, rice, soy, coconut, etc. Already “like” Earth Fare Noblesville on Facebook. That ravioli case is amazing! I have never seen anything like it. I always like to look at the dried foods – like apple rings, green beans, etc. They make great healthy snacks for the kids when we are out and about. I liked them on FB as sarah linette. I snuck in a trip this morning and loved it! I flagged an employee down to try out the grind-your-own peanut butter ( I tried the dark chocolate one) … delicious! The cheese counter is pretty amazing as well. I like Earth Fare on Facebook. I ‘like’ them on FB! How fun! I was in there today, and odd as it is, I am in love with the soaps by the register. I can’t stop smelling my hands. My favorite health food store product is all the fresh no-hormone meats… and I am loving the coffee selection at Earth Fare! I followed Earth Fare Noblesville on Facebook. I followed Earth Fare Noblesville on Twitter. My favorite health food store product are the fresh hormone-free meats.. and I love Earth Fare’s selection of coffee.